I am not very proficient at free-motion....yet! But this baby quilt needs to be finished quickly. I plan on cross-hatching the patches, but I have no idea how to straight-line quilt the barn panels. Will they look strange cross-hatched? Thanks for any suggestions!!! How about straight stitching the different bands of colours? 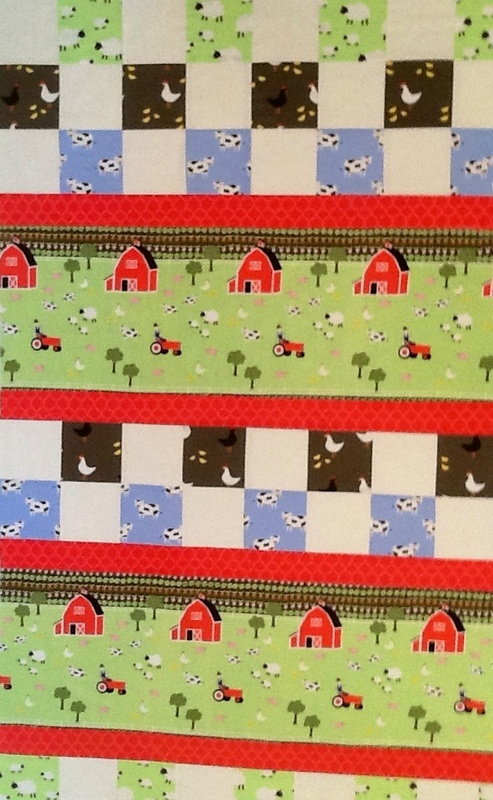 You could stitch along the red fabric, a straight line following the barn bottoms and then the red fabric again. Will that be enough quilting to meet the batting quilting requirements. You could crosshatch over it but you will need to quilt along the edge of painter's tape to keep your line straight. I think it will be easier to crosshatch the squares and straight stitch the barn sections. You could do wavy lines horizontally over the tractors and fields, and outline around the barns as you come to them (not wavy line over them). The wavy lines could simulate rows of crops. Very cute quilt! I would do loop-de-loops in the red fabric stripes, simple meander in the fields, and straight lines in the 4-patches. None of those require a lot of expertise and if they're not perfect it won't show. I think the cross-hatch would be fine across the whole quilt. Cute quilt! Thank you for all of the ideas! I have the cross hatching completed on the patches....may outline the barns and cross hatch around them....I am usually pretty fearless, but for some reason, I am paralyzed when it comes to Fmq on an actual quilt! Need to get over that, eh??? ?